This research paper presents a design of polygon-shaped microstrip patch antenna for wideband Satellite Application. The aim of this work is to design a compact-sized patch antenna, which operates at Ku-band. Two circular slots are incorporated on the polygon patch to obtain the required resonant frequency. The proposed antenna achieves an impedance bandwidth of 1.3 GHz and maximum reflection coefficient is achieved at 14.10 GHz. The antenna is a planar geometry with coaxial probe feed. The bandwidth varies with varying width of slit rings in the microstrip patch antenna. 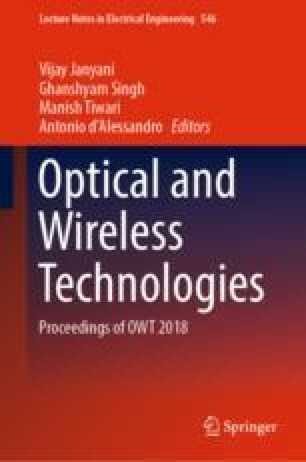 The several parameters of microstrip patch antenna are discussed in this paper such as return loss, bandwidth, gain. This work (Major project) was funded by Science and Engineering Research Broad, the Department of Science and Technology (DST), Government of India, Sanction No. EEQ/2016/000396 and Order No. SERB/F/8020/2017-18.